Last night Emily attended the premiere of The Five Year Engagement during the 2012 Tribeca Film Festival. She looked absolutely stunning in a black and green embroidered Jason Wu strapless frock from the Pre-Fall collection. She finished off the look with green alice + olivia pumps, Lorraine Schwartz earrings and a valentino clutch. 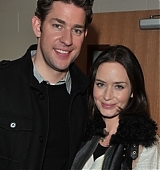 On February 22nd Emily and John attended the Ermenegildo Zegna Dinner To Support Oxfam America. Pictures have been added to the gallery. 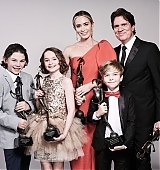 Last night Emily attended and walked the red carpet of the 18th Annual Screen Actors Guild Awards. She looked stunning in a jade chiffon one shoulder gown from Oscar de la Renta‘s Resort 2012 collection. She finished her look with Jimmy Choo heels and Lorraine Schwartz jewelry. Pictures are in the gallery! 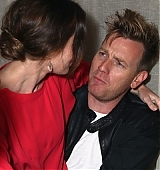 The gallery has been updated with a few pictures of Emily attending the Sundance premiere of Nobody Walks with husband John and a few pictures from day two of the festival. The 2012 Sundance Film Festival has kicked off in Park City Utah this weekend and Emily was there promoting Your Sister’s Sister. Pictures from the portrait session and premiere have been added to the gallery. 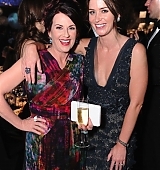 On December 6th Emily attended the LA After Party of Tinker, Tailor, Soldier, Spy. 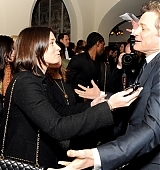 She was pictured with Colin Firth, pictures have now been added to the gallery. Last night Emily and John attended The 34th Kennedy Center Honors in Washington DC. Emily looked beautiful in a hot pink dress, pictures can be found in the gallery. Last night Emily Blunt attended the LACMA’s Art And Film Gala Honoring Clint Eastwood And John Baldessari in Los Angeles, California. On October 3rd Emily was on the front row of the Yves Saint Laurent show sporting a new cropped hair do! Pictures are in the gallery. Not a huge fan of her outfit but I love her hair and she looks beautiful. Last night Emily and husband John Krasinski walked the red carpet of the 63rd Annual Primetime Emmy Awards at the Nokia Theatre, Los Angeles. Emily looked beautiful in a tulle midnight blue gown with a plunging neckline from Elie Saab’s Autumn/Winter 2011-2012 Haute Couture Collection. She finished her look with Brian Atwood shoes, Lorraine Schwartz jewelry, and a Kelly Locke clutch. Yesterday during the Toronto Film Festival Emily attended The Variety Studio At Holt Renfrew. Pictures have been added to the gallery. Yesterday Emily attended the Grey Goose Party and Premiere of Your Sister’s Keeper during The Toronto Film Festival! 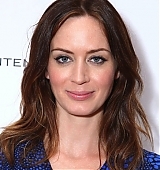 Last night Emily attended the premiere of Salmon Fishing In The Yemen during the 2011 Toronto Film Festival. Pictures have been added to the gallery. TorontoLife.com are reporting that Emily will be in attendance at this years Toronto Film Festival! Publicists for Emily Blunt have confirmed the star of the film Salmon Fishing in the Yemen will be in attendance at the festival this year. We just hope she doesn’t suffer through the same diet her character Emily went through in The Devil Wears Prada for TIFF 2011. We like her just the way she is (seriously, she’s amazing).